Homemade pasta mystifies a lot of people, but it’s actually really easy and fun to make. Get ready to take your pasta game to the next level! Want to amaze your friends and family with your awesome culinary skills? Learn how to make authentic, fresh pasta! For many people, making fresh pasta seems like a magic trick. People who can do it basically wave their hands around, say a few magic words, and suddenly, they have homemade pasta, right? It’s impressive, and to many, indicates a culinary mastery that only professionals and Italian nonnas have obtained. But, what if we told you that making homemade pasta isn’t really that hard? In fact, it’s pretty easy and fun to do. When it comes to making a basic pasta, it can truly be pretty simple. There are a few shortcuts you can take that’ll make it easier later. For one, you’ll need a pasta machine or, at the very least, a rolling pin if you don’t have a pasta machine. Another tool that will help is a pasta cutter wheel, which is like a smaller pizza cutter. Some pasta machines will actually come with a cutter attachment as well. Finally, you’ll need a flour mixture. The best pasta is made with a primarily semolina flour mixture. Many recipes call for an all-purpose flour mixture, but the best pasta is made with a primarily semolina flour mixture. Semolina flour is made of coarsely ground durum wheat, which is popular in Italian and Moroccan cuisine. It’s perfect for pasta because it’s heavier and heartier than all-purpose flour. That isn’t to say that your pasta mixture has to be 100 percent semolina flour. We’ve found that the best combination for a pasta mixture is 80 percent semolina flour and 20 percent all-purpose flour. From there, add a pinch of salt, and your basic mixture is done! Now, it’s time to make the pasta dough. A good starting place is 100 grams, or roughly ¾ cup, of flour mixture per egg. There’s a good chance you’ll need more flour, but it’s harder to add egg after, so having more egg at first is preferable. A good starting place is 100 grams, or roughly ¾ cup, of flour mixture per egg. Before adding the egg, pour your flour mixture into a large bowl. (You can also use a flat surface, like a large cutting board.) Next, form the flour into a mound with a well in the center, like a volcano. Crack the egg into the hole and start beating it with a fork, slowly adding flour into the mix. As it begins to get doughy, start mixing and kneading it with your hands. Judiciously add flour and knead the dough until it takes on a texture similar to playdough or a soft putty. If the dough is too dry, you’ve added too much flour. You can add another egg and knead it into the dough before carefully adding flour until you’ve reached the desired texture. Then, roll it into a ball. You can now either start turning the dough into pasta immediately or wrap the dough tightly in plastic wrap, and let it rest for 30 minutes. Letting it rest make the dough more pliable and prevents “snapback” when you roll it out. Once you’ve made the dough, it’s pasta time. Take your dough and sprinkle flour overtop, then flatten the dough into a rectangle with your hands. Fold the rectangle over in thirds, taking one edge, folding it two-thirds the way over, and then folding the remaining one-third over. Turn the dough 90 degrees, roll it flat with a roller, dust with flour, and fold it in thirds again. Repeat this process a total of four times. Then, roll out your pasta dough using a rolling pin until it’s thin enough to see the shadow of your hand through. If you have a pasta machine, you can use an alternative process, which is even easier. If you have a pasta machine, you can use an alternative process, which is even easier. First, set your machine to the lowest setting (usually 0 or 1). Take your fresh dough and flatten it with your hands. Dust the flattened dough with flour and run it through the rollers of the machine. Then, fold the dough into thirds, turn it 90 degrees, sprinkle it with flour, and send it through the pasta machine. You’ll do this process a total of four times. (It’s important to do because it mixes and evens out the dough.) After sending it through a machine four times, the pasta may be pretty long. Feel free to cut it in half, but just be sure to replicate anything you do to one half of the dough to the other. If you’re using a pasta machine, next, set it to the second-lowest setting. For example, if the machines start at 0, set it to 1. If it starts at 1, set it to 2. Run the dough sheet through the machine a total of four more times, each time, turning your pasta machine to the next setting before sending the dough through again. So, if the lowest setting is 0, you’d turn it to 1 then 2, and so on until you reach 4. In total, by this point, you’ll have run the dough through the machine eight times (four times at the lowest setting, and then four more times at the higher settings). Once the noodles have been cut, liberally dust them with flour and give them a light shake. No matter which method you’re using (pasta machine or rolling pin), now it’s time to cut your dough into the length you want the noodles (10 to 12 inches works). If you value uniformity, feel free to also cut the rough edges of the pasta dough so your noodles will be straight and even. If you’re using a pasta machine and it comes with a cutter, next you’ll want to connect the cutter and run the dough through whichever cutting roller you want. Otherwise, grab your pasta cutter or a pizza cutter and cut the noodles the general width you want. Once the noodles have been cut, liberally dust them with flour and give them a light shake. This loosens the noodles and prevents them from sticking together. If you’re not cooking the noodles right away, set them in an airtight container or cover with plastic wrap and set aside. When you’re ready, boil salted water and drop the pasta in. Fresh pasta cooks quickly, so you’ll only need to boil the pasta four to six minutes for perfectly al dente pasta. Make sure to taste the noodles for doneness! When they’re ready, drain the pasta water, mix in your favorite pasta sauce, and you’ve got a delicious, homemade pasta meal! With so much of this recipe coming down to touch and feel, you’ll need experience to perfect it. It sounds like the simplest thing but so much of this recipe comes down to touch and feel. You’ll need experience to perfect it. Once you’re a bit more experienced with the basics, try out different mixtures or flavors. For example, you may find you prefer more all-purpose flour instead of semolina. Some people like to use just egg yolks in their dough. Others just use water or try mixing ingredients like olive oil, squid ink, or spinach into their dough. The great thing about homemade pasta is that it’s a blank canvas. With it, you can explore your creativity and adjust recipes to fit your tastes. Below, are some instructions in a more traditional recipe format, but feel free to experiment and tweak what we have! Mix semolina flour, white flour, and the salt together. Create a well in the flour mixture and crack the egg into it. Using a fork, beat the egg and slowly mix in flour. As the egg and flour mixture becomes a sticky dough, start using your hands to knead it. Sprinkle with a little flour (remember, you can always add more) and continue kneading the dough until it becomes firm and putty-like. Put the dough in an airtight container and set it aside for 30 minutes. Flatten the dough into a rectangle with your hands, then fold it over by thirds and send it through the pasta machine at the lowest setting (e.g., setting 1). Dust the dough with flour, fold it into thirds, turn it 90 degrees, and feed it through pasta machine on the lowest setting again. Repeat steps 7 and 8 two more times, then turn the pasta machine to the next setting (e.g., setting 2), and send the dough through again. Cut the dough into 10- to 12-inch sheets. Turn the pasta machine to the next setting (e.g., setting 3) and feed the dough through. Go to the fourth setting (e.g. setting 4) and feed the dough through once more. 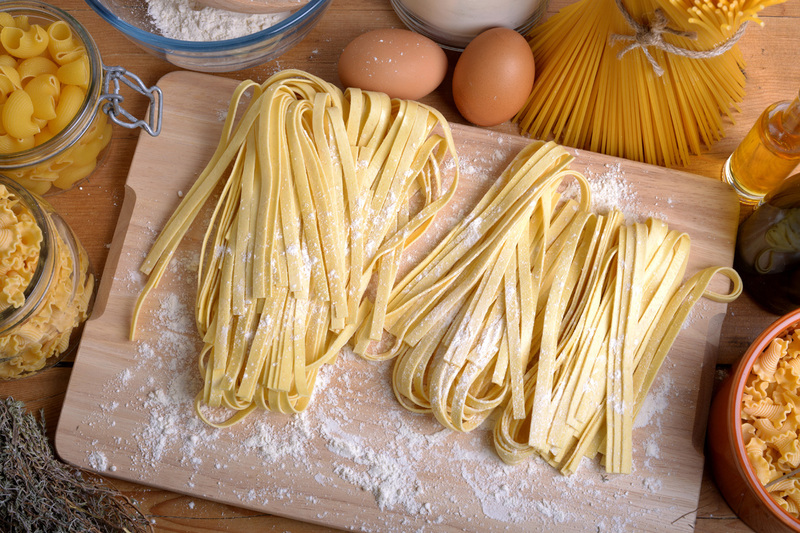 Using a pasta cutter, cut 10- to 12-inch long, two-inch wide noodles. Dust the noodles with flour, mixing them around so they’re coated. Give the noodles a shake to loosen them from each other. Bring a pot of salted water to a boil, then add the pasta. Boil pasta for five to six minutes (less for thinner pastas). Taste the pasta to ensure it’s al dente. Drain pasta water and coat in your favorite sauce.